The group has been described as “diverse” — much like the Yellow Vests, who have drawn support from across the French political spectrum — and “apolitical,” as its leadership have stated that the Red Scarves are not necessarily supportive of French President Emmanuel Macron, whose ouster is being sought by Yellow Vests demonstrators. Some participants who were interviewed on Sunday stated that they were not protesting against the Yellow Vests but instead are in favor of protecting the integrity of France’s political institutions. This has led the Red Scarves themselves, as well as subsequent media reports, to portray the group as representing France’s “silent majority” that – until now – had refrained from demonstrating. Notably, reports of such clashes largely declined to mention the role of French police in causing and fomenting violence, despite the abundance of video evidence documenting hundreds of instances of police brutality against unarmed and even prone protesters, as well as innocent bystanders. 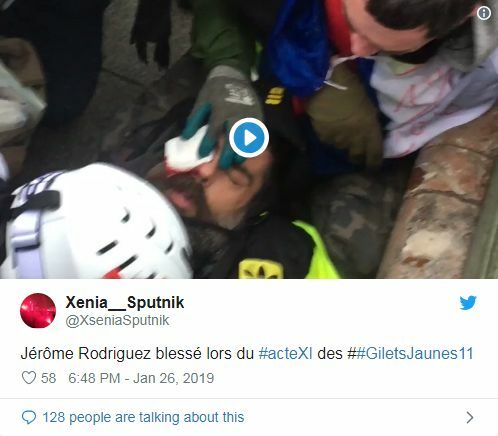 The Red Scarves themselves have also overlooked this aspect, both by “urging respect for French authorities” and by chanting pro-police slogans, as well as by asserting that French policemen have acted responsibly in response to the Yellow Vests, despite the fact that the vast majority of injuries suffered since the protests first began last November were caused by the actions of militarized riot police. Over 2,000 have been injured and 10 have been killed since the protests began.